The world's first Power Management System based on Artificial Intelligence. Spara means "save", and it saves: energy, money and the environment. It's estimated that 26% of the world's energy loses are caused by electronic devices alone being left in standby mode. 51% of these losses are accounted for by computers. Gartner estimates the total number of computers currently in use globally is around 2 billion. During the current global transition to a green economy, energy awareness and consideration of how energy is used has become the most important precondition for implementing and using any technology. SPARA is an AI based solution that run automatically or can be used by IT administrators to implement unique and individually tailored power management profiles for individual users on their networks. Variations in each user's behavioural patterns are recorded and interpreted intelligently by SPARA. Once deployed, its self-configuring software saves power as often and as economically as possible. SPARA provides maximum productivity with minimal power usage and CO2 emissions. You can see below the energy savings you can recieve from spara in the three diagrams. You can see how much energy is wasted when there is no power management on the two charts below. On the right, SPARA has been added and marked in blue is the ammount of power saved. Below is a chart comparing the power consumptions of different systems and power management programmes, as you can see SPARA uses a lot less. Is the SPARA Software essentially a scheduling system which is aided by Pattern Recognition to help in Scheduling? Can you quantify the amount of power used by a Desktop PC using a 17" LCD monitor if switched on the whole day?. And if SPARA was running on this PC what power savings might you see in a day? Some of the newer processors like the Intel Core i7 have internal power management. How does Spara work in conjunction with these new processors? If the scheduling of Spara software puts a computer to standby or hibernate -does Spara help in bringing it back online? We know that SPARA uses proprietary algorithms and establishes patterns of behaviour in users to save power and we know that we can use the scheduling functions to decide when computers should go to standby etc. But is that the primary way SPARA reduces power Consumption? Spara is a revolutionary new power management solution for computers which enables end users to save as much as 40% of the power their computers consume by allowing Spara to use artificial intelligence technology to align power management policies with actual user behaviour. So if a user of a computer regularly leaves a computer switched on when they go for lunch or go home, Spara learns this behaviour and acts to save power, reduce the costs of operation and saves you or your company and the planet from yet more carbon emissions. 2. How does SPARA work? The Spara software is a client – server software which works within a networked environment, or on a single computer and saves power through various features of the software such as Scheduling / Pattern recognition / Power Schemes etc. The Admin module of Spara has the ability to remotely perform power down operations such as System Shutdown, Hibernate, Standby, Monitor Standby etc, on the specified client nodes by remotely configuring required settings on it. 3. Is the SPARA Software essentially a scheduling system which is aided by Pattern Recognition to help in Scheduling? 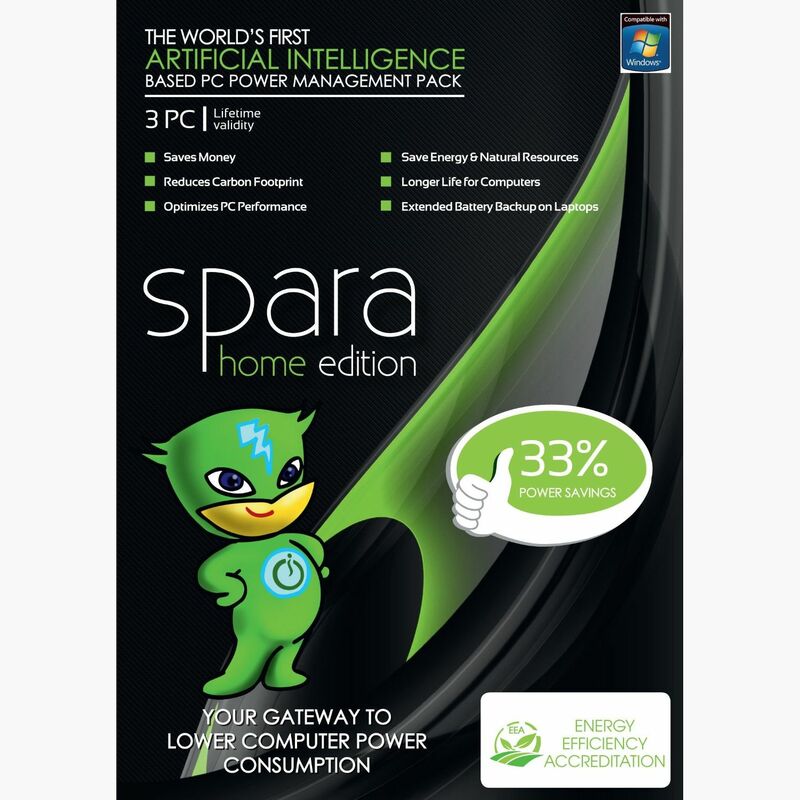 Please explain how SPARA software reduces power Consumption. SPARA hardware reduces Phantom Power using ETL –but how does the Software Component as a standalone reduce power Consumption? Manual mode: This feature allows you to issue instant Power Down commands to remote systems on the network installed with the Spara module. The idle time of each client is monitored and thus the PC can be powered down if felt necessary. Semi automatic mode: "Schedules" can be set for organisations where office timings and break timings are known beforehand so that systems which are not powered down already can be automatically shutdown by the scheduler. Another feature of Spara includes "Power Schemes" which is a semi-autonomous mode of control. This feature allows you to alter the power schemes and the client specific settings of a system. The power scheme options are in a way similar to the windows power schemes except that these take place on the Spara enabled systems and the settings can be remotely distributed to all the client nodes. Fully automatic mode: Yet another exclusive feature of Spara is the fully – automatic AI – mode which performs power management tasks by using pattern recognition. The AI module is a new technology that is designed and implemented in order to automatically set optimal / custom power schemes for users. Thereby achieving improved savings when compared to the normal power scheme settings where a computer is uniformly set to perform a particular operation according to specific idle times. 4. Can you quantify the amount of power used by a Desktop PC using a 17" LCD monitor if switched on the whole day?. And if SPARA was running on this PC what power savings might you see in a day? The amount of power consumed by a deaktop PC is so varied that it would be pointless and possibly misleading to try to demonstrate here what this might be. Desktop PCs are invariably connected to a myriad of additional devices and peripherals all of which impact on total power consumption. Average figures by manufacturer are available but these figures do not include the additional devises and peripherals we have already mentioned. So testing on an individual client basis is the preferred way of identifying total power consumption. As to the savings possible using Spara, we have tested Spara in many different situations and environments and savings range from 24% where good power management practices were already in place to over 47%. Imagine cutting your electricity bill by half. What benefit could that bring and you would nearly half you carbon emissions from your IT estate. 5. Some of the newer processors like the Intel Core i7 have internal power management. How does Spara work in conjunction with these new processors? As we all know, processing power and processors are a constantly evolving technology, new functions and features are added with each new processor release, some of which are useful and others which are not. From our investigations into these new processors we believe these new processors mentioned work by disabling unused signal and other memory usage to reduce power consumption. This is no bad thing but it is not as comprehensive or as complete as a fully automated and intelligent power management solution. We will continue to evaluate new processor technology as it becomes available to make use of this additional functionality in future releases of Spara. 6. If the scheduling of Spara software puts a computer to standby or hibernate -does Spara help in bringing it back online? The ability to remotely wake machines is not currently available in the current release of Spara. Our initial design intention was to obviously save as much power as possible and having machines automatically switched back on goes against this philosophy, however, some clients have requested this functionality and therefore we will be introducing this with the next release of Spara. 7. We know that SPARA uses proprietary algorithms and establishes patterns of behaviour in users to save power and we know that we can use the scheduling functions to decide when computers should go to standby etc. But is that the primary way SPARA reduces power Consumption? The AI algorithms and local Power Schemes of Spara are triggered as soon as Spara is installed on a system. The AI algorithm takes 5 days (Customizable) on average to learn the behaviour patterns of a user. Where as the Local Power schemes starts working straight away. Once the patterns have been established both the AI algorithm and the Local Power scheme works together to ensure perfect power savings. Guaranteed savings on the running cost of each computer/ laptop. Significant reduction in Energy Consumption, Co2 emissions and costs of operation. It also maximises the life of your computer as it useless less power, meaning lower replacement costs. No "irritation factor": Because of the way SPARA works, users also avoid the "irritation factor" where which a system which runs on other power management mode goes into a power saving mode while in action. SPARA is able to understand that the system could still be in use even though there is no interaction between the user and the system. Eliminating this can have a huge impact since statistically, it is the biggest reason most people disable power management software. Moreover, it also ensures that power cycling does not happen, preventing long term damages to the hardware. Local and international: We can install the programme any where in the UK or internationally. Full certification: installation of the programme makes you eligible for the EEA Certificate and use of the ItDoesTheJob.com accreditation for use on website and literature.